The wintry weather has me reminiscing back to the long daylight hours of Seattle summers. 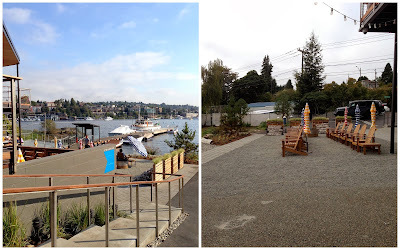 A special day this September was spent exploring Vashon Island, eating lunch on the beach, watching planes take off, stopping for tea and fresh-baked madeleines at a family friend's, and of course taking in the beautiful moonlit ferry ride back home. On our last trip to Marseille, we made sure to stop by La Passarelle, a restaurant we discovered while roaming around the city three years earlier. You can see my post about that here. Every day, they write the new menu in a notebook and share it with you when you arrive at your table. The food at La Passarelle is simple, unpretentious, and fresh. (They even have their own garden.) You can expect to order items like a satisfying savory tart, a crisp salad, or a perfectly-cooked piece of meat. It wouldn't be La France without a plate of cheese to round out the meal. This past summer, I had the pleasure of attending a family dinner at The Pantry at Delancey. The theme of the night was "Fruit Harvest Supper" and featured many seasonal fruits in an ode to summer. In true Seattle form, it was a beautiful August evening, so we commenced the meal with appetizers and rosé in the beautiful blooming garden. My favorite appetizer was the fromage blanc crostini with pickled cherries and honey. 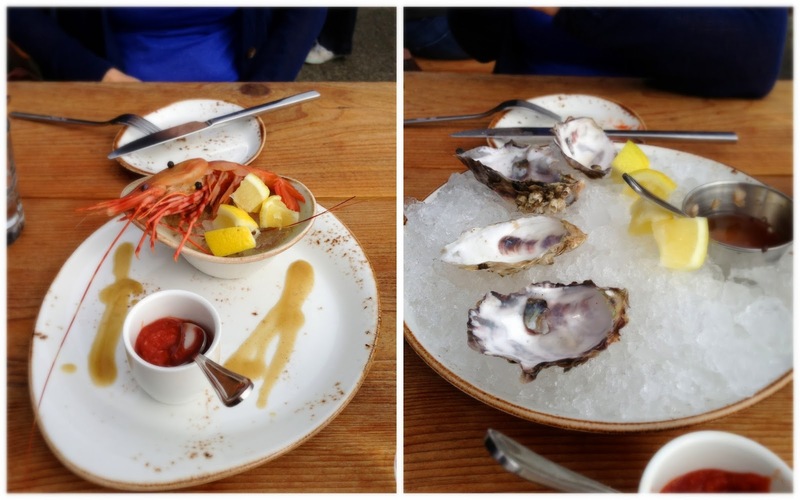 It brought together delicious flavors of the northwest in a lovely bite-sized treat. We also enjoyed arugula-chickpea fritters with blueberry-lemon creme fraiche as well as white anchovy wrapped melon and pickled pepper. As we moved from appetizers to the rest of the meal, each course was paired with a lovely wine. This was one of my favorite courses of the night: hamachi yellowtail crudo with strawberries, black pepper, shaved fennel, and lime dressing. The pinot gris from Oregon complemented this dish wonderfully. Yet another amazing course, an heirloom tomato crostata, complete with the flakiest crust imaginable. Can you say peaches? Next, we had grilled beef ribeye (cooked in the garden while we enjoyed the earlier courses!) served with caramelized peaches, bourbon, and rosemary. Yum. The long table was decorated with beautiful sunflowers. This was another winner: a nectarine, wild huckleberry, arugula, and hot coppa salad with pinenuts. It incorporated sweet, sour, and spicy elements all in one dish- the perfect salad for someone (namely moi) who can never decide between savory or sweet. By the end of the evening, we were almost full to the brim, but of course we made room for dessert: a blackberry budino with whipped mascarpone and almond cake. The mascarpone was whipped like fluffy clouds and the tart blackberries were a nice foil to the dense, nutty cake. I really enjoyed the family-style setting as it allowed us to speak with strangers. The dinner was sold-out at 22 people, however, so there were many that we didn't have a chance to speak with. Perhaps it would have been nice to have an introductory "hello" at the beginning of the meal, but all-in-all, it was a lovely evening spent with a great community of people. These family dinners are held throughout the year, but sell out quickly so make sure and sign up as soon as they're announced! I first checked out Westward late this summer when the weather was still nice enough to take advantage of the restaurant's amazing outdoor seating. 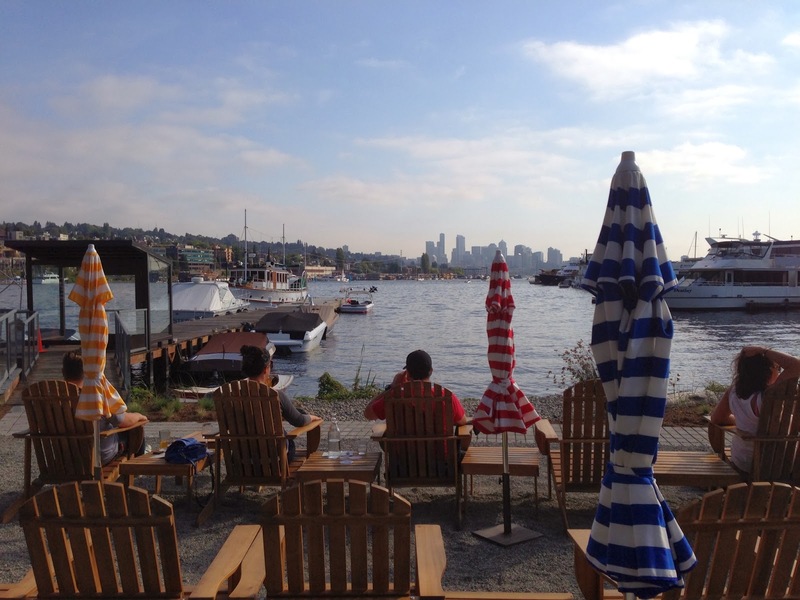 In addition to the fabulous adirondack happy hour chairs, there are communal-style tables to enjoy a bigger meal, all while taking in the view of Lake Union. The Alaskan spot prawns were fresh and tasted of the sea. A little squirt of lemon juice was all they needed. We enjoyed our oysters as well. I love a good watermelon salad but I can't bring myself to like fried haloumi, no matter how many times I try. I find the texture far too rubbery, so I would have preferred the salad with feta cheese or something with a more crumbly texture. The pistachios were a great addition to the salad however, and this was a nice dish to say goodbye to summer. I can always appreciate a good lox dish and this one was no exception. The salmon was cured very nicely. The creamy labneh and crispy toasts provided nice texture contrast. I definitely enjoyed the dishes I had at Westward, however I think the selling point of this restaurant is the location. As soon as the temperature hits 60, I'll be bringing out-of-town friends to grab a drink on the sun-filled patio. 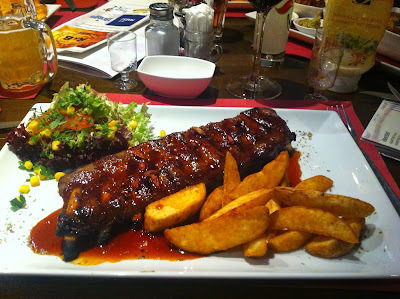 Ribs 'n Beer, a cozy restaurant in Bruges, does a mean business. The service is friendly yet brusk and efficient. 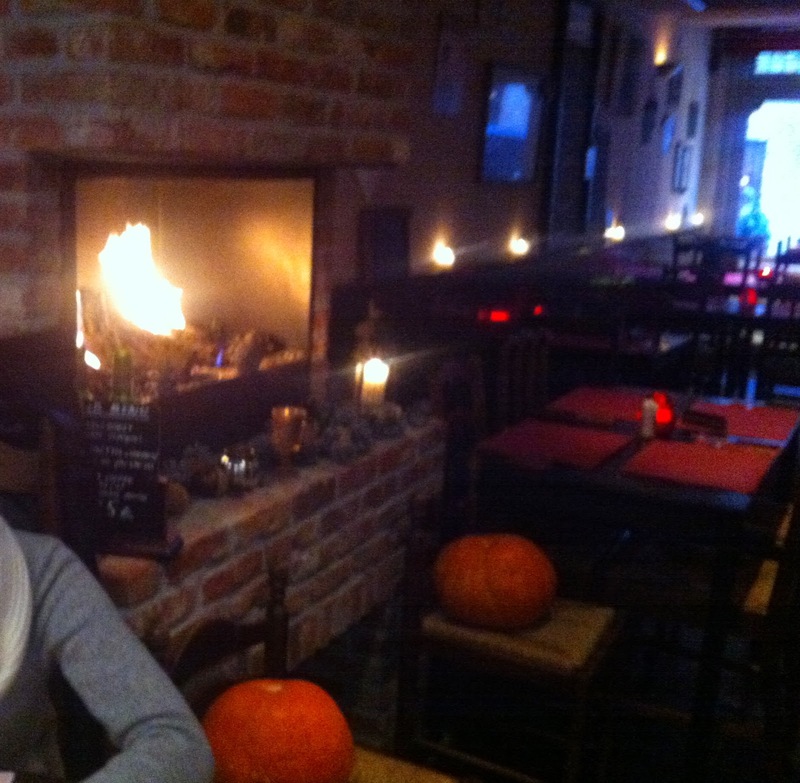 On our most recent visit to the city, we had the opportunity to eat dinner here, by the roaring fireplace no less. I haven't eaten too many ribs in my life, but the ribs here are finger-licking good. You can have your pick when it comes to the rib sauce--even the sauce made with chocolate is rich and flavorful. This establishment is always packed so be sure and have a reservation. On a cold winter's night in Bruges, BBQ ribs are just what the doctor ordered. My favorite food spot in Stockholm happened to be just down the street from our apartment. Pom and Flora Cafe is the most darling brunch/lunch hangout in Stockholm's Södermalm neighborhood. We first stopped in on a weekend morning and the owner was so sweet, taking time during the busy brunch rush to help us out, item by item, with a translation of the Swedish menu. Each brunch came with a "bread basket" of homemade biscuits (made on site) and hearty breads sourced from local bakeries. We also got homemade ginger-orange marmalade, yogurt with berries, nuts & seeds, a meat & cheese plate, lattes, and fresh-squeezed juice. Everything was delicious. The restaurant is small and fills up quickly with neighborhood residents, children, and babies. We felt right at home. When leaving, the owner suggested we come back to try the lunch. On our last day, we did just that and enjoyed tasty chicken curry sandwiches, a tuna-sesame-humus salad, and a unique bread salad with mozzarella and pesto that featured three different types of pickled tomatoes. The owner mentioned that the cafe has been open for about nine months and she created it because she didn't think Stockholm had a place of its kind. (She was influenced by the idea of the "Le Pain Quotidien" cafes.) I don't know exactly when I'll be in Stockholm again, but I'll make sure my first meal is at Pom & Flora. The owners at Cafe Turko are like a bonus set of grandparents. They're old school, friendly, and fun to banter with. They come from Izmir, a place I didn't have the chance to visit on my trip to Turkey this summer but is definitely on my list for the future. When I get hunger pangs for Turkish breakfast, Cafe Turko is where I'll head. I recommend going for brunch and getting: Turkish lemonade w/ sour cherry syrup, the Mother-in-law breakfast (includes warm bread, olives, apricots, cheeses, tomato, and cucumber), and the stuffed bread (pide) w/mozzarella, tomatoes, and olives. Finish with a dessert selection of pistachio baklawa and orange semolina cake washed down with cardamom tea. While I'm aware that the subject of this post may not be the most enthralling, I hope it proves useful to travelers passing through Lausanne, Switzerland. After one too many luggage horror stories, mostly involving Fiumicino Airport, I've reformed over the last few years and become a carry-on enthusiast. Often times (especially on longer trips or those that involve multiple climate changes), that means having to do laundry while on the road. I actually enjoy this ritual as it makes me get into the mode of resident not tourist. Laundromats are great places for people-watching and I've seen a multitude of characters while sitting on washers. I tried to do a search for laundromats before I went to Switzerland but came across discouraging results. So during my trip last month, I was pleasantly surprised to find this self-serve "laverie" right in the center of town. We loaded up the machines and one by one, slowly dropped our franc coins down the slots. My brother's machine started up without a hitch. I, however, was unable to get my next coin down as there was a jam. And too bad the machine doors lock once they've been closed. I started to panic as our flight out of town was that afternoon. Well, at least I wasn't too attached to the particular clothes in the machine. I called the number listed on the wall and a man said he'd be over "dans un petit moment." That turned into 30 minutes- we asked another woman in laundromat and she said she was a regular and called him up. "He's coming," she said. In the meantime, my mom went to the kebab place across the street to borrow a butter knife. We tried to push the franc down the slot but to no avail. Eventually the owner arrived with his son and he proceeded to open up the coin machine and unjam the slot. He put our clothes in for free and apologized for the situation. I heard him speaking Tunisian Arabic to his son and asked him if he was from there. Yes, I shamelessly pulled out my Tunisian card-it's always served me well and this was no exception. We all had a long discussion about Swiss society, the situation in Tunisia v. Egypt, and of course food. When we came back to transfer our clothes to the dryers, he asked us when we were leaving town as he wanted to invite us over for couscous. Had we not had to leave for Stockholm that afternoon, we would have happily dined at Kamel's house that evening. And that, is why doing laundry while traveling can be fun. Kamel's Laverie is located at 26 Rue du Maupas in downtown Lausanne. It's self-service, opened 7/7 from 7am-10pm. Some tips: Bring your own soap because the detergent machine was completely sold-out. It's 6 francs for a wash (7 for hot temperatures) and 6 for a dry cycle.